Having a park in the community is a wonderful addition. It can help to raise property values, offer a safe place for families to gather and be a safe place for children to play. Unfortunately, parks are also an attractive target for vandals. When vandals come in, they can ruin this community area for everyone. Here are some ways that you can protect your community park from vandals and deter anyone from taking advantage of the area. One suggestion that you might want to consider is security cameras. Cameras can be installed throughout the park and monitored from another location, or if you don’t feel the need to constantly monitor the feed you can just check the recorded data to find the perpetrators after an act of vandalism has occurred and turn it over to the local police. However, this may not even be necessary as cameras actually make a big difference in the safety of a community park just by being present. According to a report by the Urban Institute, crime drops by as much as 20% when security cameras are installed. Most often, vandalism will occur under the cloak of darkness, so it makes sense to prohibit the use of the park after dark – stopping vandals from targeting the community park with security fencing and gates around the perimeter. The Australian Institute of Criminology says that vandalism, like graffiti, costs over $200 million to deal with each year. By installing fencing, you can lower these costs a significant amount. 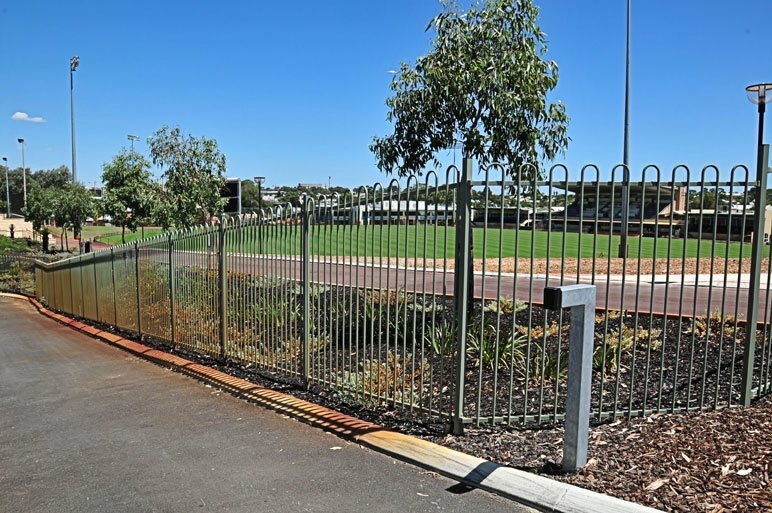 Fencing and gates not only offers a clear visual deterrent, Fencemakers range of tubular fencing and gates are designed to stop even the most determined effort to access the property. Fencemakes has a couple of designs which have been specifically designed for use in public spaces, like parks and housing estates. These fencing and gates products balance the need for strong construction, ensuring they last the test of time, as well as being aesthetically pleasing. Fencing is also a great way to monitor who is coming in and out of the park during open hours as there will be a limited number of entrances. Additionally, security fences can help to make sure the children, families and pets within the park are secure within, and can ensure that kids do not run onto roads if they are left unsupervised for a short period of time. You also might want to consider some type of security guard for your community park. This might be a hired guard for instance, or local law enforcement might step in to check the park on occasion. Just like with other security features, simply having a guard on patrol can deter vandals as they know they can get caught at any time. Security guards will not only be able to protect the park itself, but also be able to deter crime in surrounding areas by being there. Communities also have had a lot of luck with reducing vandalism when they redesign their parks. Most of the time, people tend to vandalise areas that are already in disrepair. By improving the design of your park and keeping it in good shape, you can reduce the chance that vandalism would occur in the first place. Installing secure restrooms, commissioning murals and keeping the park well maintained can ensure the facilities are used for their intended purpose and not for criminal acts. Finally, you want to make sure that your the park is more inviting to the community, families and children. The more people from the community using the park, the less likely it will be that vandals will begin to loiter in the area. Putting in new, colourful equipment or using available land for a community garden will make a park more inviting than ever before. You could also consider installing picnic areas and grills, water features and sports facilities. A community park should be a place where the community as a whole can feel safe and relax with friends and family. There is no reason to put up with vandalism in your community park when there are remedies to stop it. By making some changes to your park that focus on stopping vandalism, communities can make their parks welcoming to all. People in the community don’t want to visit a park that is dirty, decrepit and vandalised. Instead, things like adding fences, making your park inviting and hiring security will make your park a safe place.